PISKY, Ukraine -- It was a perfect afternoon in early summer. Somebody had placed a garland of fresh flowers on the rusting wreckage of a tank. 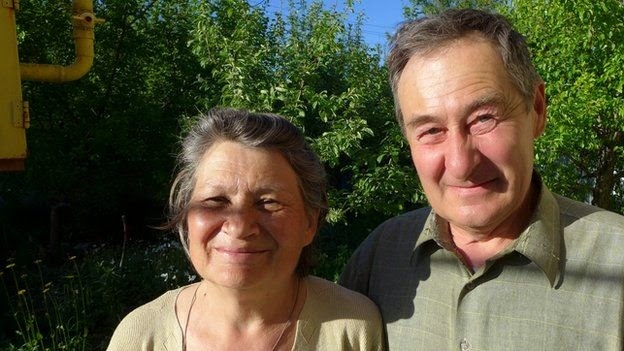 Anatoliy and Svetlana Kosse, both aged 68, were among the few residents still here. The pair could not bear to be separated or leave their home. Men died here and were remembered. Although the fields were empty it was possible to imagine them filled with workers harvesting the sunflower crop. This was the lull, the space between bombardments when the land reminded us of its true purpose: not a battlefield but a place of abundance. I remarked to a colleague that the calm was our greatest enemy here. It lulled us into a false sense of ease. And then it started. I heard shouts of "Go, go, go" in English and Ukrainian. There were loud cracks and flashes in the fields nearby, then the surge of adrenalin; the fear - impossible to convey - of being caught in the open by artillery. Another small moment in the life of a war we have reported on for the past year. Much of that time has been spent in the villages around Donetsk airport, like Pisky. Of a pre-war population of 3,000, there are now only around 40 people left. We had come back to Pisky to spend a night in the company of a couple who refused to leave one of the most embattled places on the Ukrainian front. Anatoliy and Svetlana Kosse, both aged 68, were among the few residents still here. All around them were the ruins of houses struck by shellfire. Their days and nights are punctuated by the noise of artillery, rockets, mortars and gunfire. But alongside this murderous back and forth there was a more hopeful soundtrack. We heard it in the garden where Anatoliy tends his bees, in the kitchen where Svetlana cooked us dinner from the vegetables she grew and the eggs from her henhouse. It was the unrehearsed but determined music of life that refused to be yield in the face of war. The village sat close to Donetsk airport and on the frontline between the Government and rebel armies. There was no electricity or water. Food supplies were meagre: the couple survived on what they produced and on occasional aid deliveries. "It is terrifying," said Svetlana. "Before I only had a few grey hairs here. And now you can see. When I look at myself with my glasses on, it is terrifying." So why did they stay? Why did they not leave for the city? I asked these questions of Anatoliy as he tended the beehives. "I am taking care of them, they are here, how can I just leave them?" he replied. To leave would be to abandon all they had worked for. In fact Svetlana did move to the city for several months. Anatoliy stayed behind to take care of the home they had created together with its crop-filled garden, beehives and neat rows of flowers. We were sitting over dinner when Svetlana described what happened after she left. "When he was alone here, every morning and evening we called each other. I had a strong pain in my soul and so did he. He was a lonely man here because all the neighbours moved away." They decided to endure the danger and the stress. I asked Anatoliy what his wife meant to him. "How can I explain what she means to me?" he said. Then he smiled and leaned across and placed his head on her shoulder. The shelling and shooting went on. It was a perfectly clear, starlit sky. And below the stars, shining brightly, we could see the unmanned aerial drones searching for targets on the ground. When we left the following morning I told Anatoliy and Svetlana that in war I had met all kinds of people but they were among the nicest and bravest I'd ever come across. "You make too much of us," Anatoliy replied. I was struck by how much laughter there was in this home. Every day now I read of fighting in Pisky; I think of the beekeeper and his wife and I curse the war that threatens such decent people.